Since winning the Hungarian general elections in 2010 with a two-thirds majority, Viktor Orbán’s nationalist-populist party Fidesz has introduced an authoritarian administration that is reminiscent of Hungary’s interwar regime, when Miklós Horthy ruled as an ally of Hitler. When state socialism collapsed in 1989, liberal ideologists propagated the idea that an age of Western-style democracy and living standards had arrived for Eastern Europe. Widely believed for some time, today that illusion is truly over. The Hungarian liberal parties have ceased to be a political force, the ‘moderate left’ has become peripheral, while a radical, system-critical left only exists on the pages of a journal called Eszmélet. Most of this precariat derive from a strata of uprooted peasants, workers whose workplaces were shuttered, Roma and hundreds of thousand of pensioners. Those on the top of the new social structure draw from a small group of new big businessmen and a thin layer of the new upper middle class closely connected to the ruling class. Between the two extremes there exist a multitude of small entrepreneurs and those employed in public institutions – in general, salaried workers. Facing a perpetual threat of unemployment and social descent, not only do individuals suffer instability, but so too does the entire social structure. In such a condition Hungary appears to be returning to a caste-based system, one which marks a radical break with that of the socialist Kádár regime and reveals a deep affinity with that of fascist Horthy. Meanwhile, liberal critics tend to focus on Hungary’s populist attitude, the severe restrictions on political rights and the growing role of the state in economic matters, all of which are typical of the Fidesz party. Though Fidesz is resolutely anti-communist and coquets with the Extreme Right, liberals have drawn the conclusion that they embody ‘Kádárian’ and ‘communist’ features. Behind their rubric of a ‘mafia state’ they efface the Horthyist roots of this regime as well as its specific feature, the semiperipheric form of capitalism specific to Eastern Europe. The Horthyist tradition of an old gentry ruling class never disappeared, and the source of its legal ‘revival’ took place under the banner of liberal democracy in 1989. At the same time it cannot be denied that the politics of reckoning with the Horthy regime was quickly replaced by a politics of integrating significant groups of the old gentry and (even) the aristocracy into the socialist system. The integration of the old Extreme Right, a considerable group of fascist Arrow Cross thugs, had already begun in the 1950s. Hence it is not completely unfounded for today’s liberals to accuse state socialism for the recent revival of the Arrow Cross tradition. Yet whilst the new system does consist in the debris of former regimes, the Kádárian elements are by no means the most prescient. It is important to understand that certain elements of the Kádár regime – above all its paternalistic–bureaucratic character – only lends potency to Fidesz’s neo-Horthyist restoration, while their renewal occurs without the specific social and cultural context of the socialist era. The roots of today’s autocratic misery, with its extreme social inequality, grow from the Horthy regime, or rather from the age of the Austro-Hungarian Empire before it. International conditions have also played an important role in the formation of this regime. Both the EU and the USA have persistently taken a paternalistic vantage to criticize Viktor Orbán’s government for its anti-democratic political steps, its concentration of power, its open anti-Semitism and anti-Roma sentiments. However, they have never attacked its legitimacy, since the government maintains a low budgetary deficit. By now it is well recognized that the Eastern European and Soviet change of regime was inseparable from the neoliberal restructuring of the global capitalist system, and from the new forms and challenges of multinational capitalist power. The solution of the ‘communist reformers’ to the Soviet Union’s inability to compete economically and militaristically against the West was to ‘integrate’ into capitalism with the help of the core Western countries. The result is well known: Viktor Orbán’s regime. The main aims of the state in the socialist period was the elimination of the national bourgeoisie and the abolition of private property. It was illegal to trade state property. The new regime acts in the opposite way. The government nationalizes factories, land and other types of property in favour of the new bourgeoisie, which the government has itself created, in order to then re-privatize it all. The freshly introduced bourgeois class has flourished in the Fidesz era since it first received its capital from public funds; it has an especially parasitic character. Under a nationalist banner and with the help of the upper strata of society, certain groups of the renewed power elites are today trying to make their privileges inheritable, thereby outfacing both foreign capital and Hungarian society. As a result, they have restructured the system of distribution and deepened and widened the social–cultural inequalities of society. The same can be seen across the region: in Ukraine, Latvia, Bulgaria, Belarus and Romania. The political weakness and cultural deficiency of the new ruling class have hindered the new capitalist system from stabilizing, despite Hungary’s accession to the EU. The new ruling class4 put their hope in Orbán’s ‘Christian-national’ government as it represents their values, fiscal interests and poor culture whilst privileging their attainment of budgetary resources. These layers of the new ruling class specifically fell back on government support because they did not know how to ‘treat’ the constantly growing masses of unemployed and impoverished workers. In other words: how can an impoverished society be restrained and disciplined under a returning economic crisis? The social-liberal coalition that ruled prior to Fidesz between 2002 and 2010 had no solution, hesitating between old-fashioned ‘routine’ neoliberal economic policy and propaganda based on EU gobbledegook. Hence their political representation lost its backing and dissolved into a shrunken group of irrelevant ‘survival’ politicians. Whilst the Extreme Right gained strength, the ‘Christian-national’ coalition of Fidesz and the Christian Democratic People’s Party won the 2010 elections on a super majority mandate that allowed them to enforce their own ‘solution’ to the nation’s problems. In Hungary and other Eastern European countries, those in power soon came to understand the need to introduce an authoritarian regime which would hollow out the parliamentary form and political party system. They promised undisturbed mechanisms of governance to both the European leadership and the Hungarian public in return for European legitimation of their so-called ‘system of national cooperation’. Everyone who could or would not fit into such a framework came to be considered an enemy of the nation: communists, atheists, liberals, Jews, Roma, foreigners and all of their supposed ‘patrons’. This system predetermines the fate of each party. Under the second iteration of the Horthy regime ‘other parties’ (not inclusive of communists, of whom all forms have been banned by law and institutionally criminalized) are required to revolve around the sun – the ‘wise leader’ and his party, Fidesz. In other words, though Fidesz formally and legally could be displaced, in reality they want to secure ‘eternal’ power for a segment of the ruling elite, for the Christian-national (this term also derives from the Horthy era) wing. According to this aim, the parties that the power elites consider to be small and unimportant are systematically crushed in a material, political and moral sense. The ruling elite makes use of open oppression and bare lies. It operates through a system of institutions and committees that effectively produce the institutionalized world of fraud and falsified history by criminalizing the state-socialist past. The ultimate political meaning of these actions is quite apparent: a complete closure of political alternatives on the left. For this they can get constant help from the liberal Right (in spite of its half-hearted, fruitless political opposition) with its enduring anticommunist propaganda. A necessary condition of these processes has been a systematic domestication of huge masses in society: the neo-Horthyist restoration cannot be understood if we forget this. There was no serious social opposition to the return of the Horthy cult. The lack of social resistance partly derives from the experience of the socialist Kádár regime. Despite the regime’s progressive social achievements in terms of welfare, its bureaucratic nature hindered the majority of the population from rising beyond a paternalistic relation to the state. This dearth of autonomous individuals provides beneficial ‘human material’ for the new regime. As in Poland, where the political Right and the Extreme Right have over 80 per cent of representation in parliament, the Left is almost completely unorganizable in Hungary given that no system-critical social mass movement can take root. The working class is dispersed and impoverished both in a material–economic and intellectual–cultural–mental sense. The social structure that grew out of 1989 discredits the Kádár regime at all costs and falsifies its history in order to manipulate and indoctrinate the younger generation. In a quarter of a century the new capitalist regime, no matter how we judge the historical role of state socialism, has not been able to match the economic and social achievements of the old Kádárist system. From its failures the stinking flower of the neo-Horthyist restoration has shot up. Neo-Horthyist restoration naturally bears all the important marks of today’s capitalist world. It is a strange ‘postmodern’ creature that borrows its patterns and solutions from neoconservative American governance: its criminalization of poverty, the principle of zero tolerance, the criminal politics of the three strikes, regressive income tax rates, the moral cult of religion, along with extreme inequality and absolute individualism. As elsewhere, the Hungarian government has made strides in protecting the rights of the banks against the people. Repossessions are commonplace. The government has introduced ‘counter-reforms’ to limit labour rights, the right to strike and the right to earn a fair wage. Similar repression has been met on the right to welfare, education, water, protest and speech. Ecological commons are expropriated and sold. Debates on rights are confined to liberal political philosophers; the right to private ownership is left unquestioned whilst none demand collective social–economic and human rights. Political power has completely absorbed the majority of the Hungarian intelligentsia through money, positions, privileges and threats. It is not by chance that we live in a period of shocking decline in social science research and thought. The ideological glue of the new authoritarian regime is obviously nationalism and an officially defined neo-Horthyist Christianity that pervades everyday life. The new constitution was conceived in the so-called ‘Christian-national spirit’, so that in its preamble it excludes the majority of society that is not Christian or religious, or is downright atheist. National populism has gone so far as to make heroes of the Hungarian soldiers who actively took part in the Nazi genocide. Fascism and Nazism are officially – including in school textbooks – considered equivalent to ‘communism’, and in this way the complete history of socialism is criminalized. Intellectual life and culture in general are transformed in the official image. A separate institutional state apparatus has been established to accomplish this task, including the House of Terror and the Veritas Research Institute for History, which was founded in order to establish ‘the truth’ in historical problems and intensify the neo-Horthyist restoration among intellectuals. All this ideological nonsense manifests in a nationalist anti-Western freedom fighter’s rhetoric, which coexists with the precise execution and fulfilment of Western economic rules – where the rhetoric serves as the system’s smokescreen. Most people simply accept the rhetoric of the ‘exploitation of the Hungarian nation by the Western multis’. Fidesz initially incorporated fascists into its ranks; then, in order to make itself presentable to Europe, it pushed Jobbik, the party of the extreme Right, out of its circles. At the same time it attempted to lure neo-fascist voters with an unrestrained anti-communist campaign. After all, scapegoats are needed! Within the framework of ongoing cultural struggle, ethnic and racist nationalism, together with ‘Great Hungary’ kitsch, has pervaded society whilst social problems have been pushed aside. The ideological victory of the new authoritarian system has been made plain just as it was after 1919, when Miklós Horthy came to power. Every day the ‘new’ neo-Horthyist culture takes revenge on the Left. The favourite writers of our time are no longer Tibor Déry, Andor Endre Gelléri or Lajos Nagy, but the fiercely antiSemitic Albert Wass, József Nyírő and Cecile Tormay. Our heroes are no longer Marx, Engels, Lenin and Lukács but the gendarme who shot dead the communist leader Endre Ságvári. 1. ^ Bartha Eszter, Magányos harcosok: Munkások a rendszerváltás utáni Kelet-Németországban és Magyarországon [Lonely fighters: Workers in post-socialist East Germany and Hungary], ELTE BTK Kelet–Európa Története Tanszék [Eastern European Monographs Series, 2], L’Harmattan, Budapest, 2011; Uő, A munkások útja a szocializmusból a kapitalizmusba Kelet-Európában, 1968–1989 [Workers on the road from socialism to capitalism in East Germany and Hungary, 1968–1989], ELTE BTK Kelet–Európa Története Tanszék [Eastern European Monographs Series, 1], L’Harmattan, Budapest, 2009. 2. ^ Ferge Zsuzsa számításait vö, Népszabadság, 25 May 2012; Ladányi János, Leselejtezettek. A kirekesztettek társadalom–és térszerkezeti elhelyezkedésének átalakulása Magyarországon a piacgazdasági átmenet időszakában, L’Harmattan, Budapest, 2012. 3. ^ János Kádár (1912–1989) was a Hungarian communist leader and the general secretary of the Hungarian Socialist Workers’ Party. He presided over the country from 1956 until his retirement in 1988. 4. ^ It should be noted that a basic cultural and ideological rift exists between the ‘ex-communists’ (neophyte liberals, ‘Kádárist’ managers, etc.) and the ‘Christian-national neo-Horthyists’ (the offspring of the old Horthyist elite joined by ‘ex-communist’ careerists and some of the ‘ideology-free’ new capitalists) – the latter being in strong competition with multinational corporations. 7. ^ Ágnes Huszár, ‘Templom és iskola’, Galamus, 19 December 2013. Fol owing the death of Georg Lukács, the Soviets seized the opportunity to commemorate but also to direct his legacy by turning his apartment, which overlooks the Danube, into an archive. Within it are the books that Lukács dragged with him to Germany and Austria after fleeing Budapest, fol owing the fall of the short-lived Hungarian Soviet Republic in 1919. Here, one can see the notes jotted into the margins of his copy of Hegel’s Phenomenology or his later revisions to History of Class Consciousness. In rooms lined with books, you find centrally placed an entire floor-to-ceiling bookshelf fil ed with Goethe, or Lukács’s large wooden writing desk and photographs. With the fall of the Soviet Union, it was hoped that the Archive could finally freely control and explore its content. Librarians and researchers worked to make it not only a library housing his books and manuscripts, but also a place for scholars and enthusiasts to host dialogue and discussion. 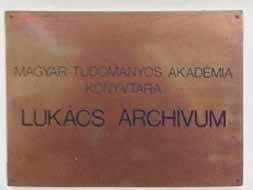 In this way, the Lukács Archive was able to maintain a certain level of independence. However, looming anti-communist sentiments in the new Hungarian state soon dropped Lukács out of favour once again. After years of struggling to keep the Archive open and active, its few librarians and volunteers have now been informed that it will be shut down and its contents dispersed across the city. It is unknown exactly why the president of the Hungarian Academy of Sciences, mathematician László Lovász, wants to close it down. Some fear that the right-wing Hungarian govern ment – whose sweeping educational reforms have restricted academic autonomy – has ideological interests in its closure. Others have noted that the Archive sits on prime real estate. The reaction across the world has been clear. As of 1 April, over 9,000 people have signed a petition to keep the Archive intact. Its librarians and Lukács’s few remaining students, including a recently returned Agnes Hel er, hope to sway the Academy of Sciences’ decision.